Philips and Cisco share their joint vision for connected public lighting for cities in a Point of View paper titled ‘’The Time is right for Connected Public Lighting within Smart Cities’’. The paper highlights the importance of lighting to help create a livable city, and the opportunity to save energy by the implementation of energy-efficient LED lighting. The companies outline an innovative approach to realize additional savings by connecting lighting to the Internet, deriving even greater value by using the lighting network for other connected services. Surging demand for energy and resources: With cities accounting for 70 percent of the world’s energy consumption and greenhouse gas emissions,2 there are increasing concerns about the price and availability of energy resources—and their environmental impact. Cities’ desire to establish a strong identity: Inter-city competition for people and business is on the rise, creating conditions for economic growth. Growing connectivity: There are huge, new opportunities to improve urban life through intelligent, highly efficient solutions enabled by information and communications technology (ICT). Increasing urgency and public pressure will drive adoption of advanced city operation systems. Rapid urbanization around the globe presents cities with the challenge of ensuring their “livability.” The Philips Livable Cities Think Tank3 has identified three important ingredients of a livable city: resilience, inclusiveness, and authenticity. Resilience focuses on a city’s flexibility and balance—the ability to adapt to the requirements of the city; inclusiveness refers to a city’s ability to generate a sense of community in all sections of the population, irrespective of gender, age and ethnicity; authenticity is the local character or identity of a city. Creating a resource-efficient, environmentally resilient city: Adopt energy solutions that keep pace with a city’s progress and prepare it for an exciting future by minimizing resource usage and environmental impacts. Ensuring the safety and security of all citizens: Make people feel safer by improving driving conditions, discouraging crime, and reinvigorating urban spaces—from neighborhoods and communal spaces to parklands and highways. Establishing an attractive, vibrant image: Cities want to express their unique, distinctive identities and truly shine on the global map, attracting businesses and tourism. Responsible, “smart” lighting is no longer a “nice to have” for cities—it’s imperative to ensure that cities develop in a sustainable way to ensure a healthy future. Artificial light is an essential element of urban environments—not only after dark, but also as part of a city’s identity. It affects residents’ sense of safety and social inclusion, and also influences the degree to which cities can create an inviting environment for business and tourism. Philips estimates that a complete switch to LED technology can generate savings of approximately €130 billion —an enormous sum equivalent to the elimination of 640 medium-sized power stations globally. Furthermore, an independent, global trial of LED technology in 12 of the world’s largest cities found that LEDs can generate energy savings of 50 to 70 percent—with savings reaching 80 percent when LED lighting is coupled with smart controls. The program also indicated that citizens of pilot cities prefer LED lighting, citing the social and environmental benefits, such as a greater sense of safety and improved visibility. The report, “Lighting the Clean Revolution: The Rise of LEDs and What It Means for Cities,” was launched as part of “The Clean Revolution” campaign at the Rio+20 UN Global Compact Corporate Sustainability Forum. Produced by The Climate Group in partnership with Philips, the report supports the campaign’s argument that major energy savings can be achieved virtually overnight at relatively little cost. Switching to LED lighting alone, however, will not be enough to meet cities’ energy consumption and cost reduction targets. Adaptive, interoperable lighting solutions are needed to bring savings to a next level. Urban leaders now face a dilemma: cities are complex entities where inefficiencies arise because systems are not interconnected and have no way to “talk” to one another. A joint effort is required to realize the vision of smart connected cities, enabling meaningful innovation for years to come. 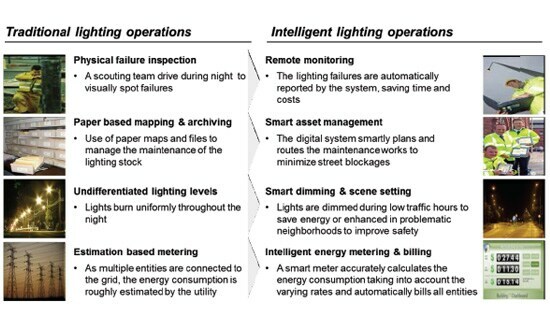 We thus see the future of public lighting as a transition from analog to digital, from fluorescent lightbulbs to solid-state lighting—all connected to an energy grid through a variety of last-mile access technologies (see Figure 1). Figure 1. Moving from “Traditional” to “Intelligent” Lighting Networks. Additional savings can be achieved by incorporating connected controls to the Internet. And even greater value can be derived by using the lighting network for other connected services. Ubiquitous wireless connectivity and an “Energy Internet” are recognized by city authorities as enablers of these improvements. Studies have shown that infrastructure plays a key role in making the planet more livable. Two questions arise, however: 1) What is a sustainable city infrastructure, and 2) how can companies help cities set these up? With a mutual market focus around “livable” connected cities, Cisco and Philips are developing new concepts and innovations around network- enabled LED street lighting, including widespread education of elected officials, city managers, investors, and industry peers; development of new and powerful business ecosystems; and proofs of concept with leading cities. Cisco and Philips are looking at how extra benefits can be derived in cities by connecting public street lighting to the Internet—the “Energy Internet” (sometimes called “Smart Grid”)—and other IP networks, which we expect can add significant incremental benefits to the “stand-alone LED” described above. We are in the midst of a double market transition, where LED not only becomes a compelling proposition, but the energy grid also starts to become a two-way communications network, allowing businesses and consumers to generate, store, and sell electricity, as well as consume it. The grid will become another IP platform connecting people and devices through IP in even more ways than we imagined 20 years ago with the telecommunications network and the Internet. In some cases, we are already building an “Energy Internet.” When data starts to flow in an open way between traditionally closed or proprietary infrastructure such as public lighting and traffic and waste management systems, we can envisage completely new ways of using data communications and connectivity to make devices and systems “smart.” This will generate value in the form of additional operational savings or revenues from these enhanced service offerings. Depending on the amount of bandwidth and penetration across the lighting network, a multiservices platform is emerging that utilizes lighting infrastructure for other services in the areas of public safety, intelligent traffic and parking, as well as advertising by means of video, sensors, and public hotspots. In order to move away from traditional tendering, which has focused on initial cost (and, as a result, on inexpensive but not necessarily sustainable solutions), cities are now considering the entire lifetime cost of infrastructure, or total cost of ownership (TCO). The notion of TCO takes into account all costs linked to new infrastructure: from the initial investment (CapEx) to the operating costs (OpEx), such as costs of maintenance, re-lamping, energy, disposal, and so forth. Within a Smart City context, however, infrastructure will become a dynamic platform enabling continuous innovation. It thus needs to be looked at from a different point of view: total value of ownership (TVO). Only then does the case in favor of sustainable, livable infrastructure become clear. Linking the project to the city’s vision in terms of livability, economic growth, and sustainability. Defining the connected public lighting infrastructure as a “network of networks” and a platform for service innovation. Working actively with stakeholders such as city officials, retailers, shop owners, police, telephone operators, ISPs, and, of course, citizens to create meaningful use cases. Investing operational cost savings (not only from lighting) in the platform to enable new functionalities. Measuring the total value generated year-over-year in terms of savings and revenues, jobs created, and livability improvements. Smart, innovative solutions that break away from traditional, energy-intensive, wastegenerating approaches. Solutions that eliminate silos of information within a city, thus allowing for more efficient sharing and utilization of information and resources in an open way. Data-collection devices. Sensors and metering systems enable the city to generate information about its own infrastructure usage and condition. Networks. Different types of networks connect these devices with a central datacollection unit. Once the information is generated, the network allows it to be transported to a server. The communication media itself can be fairly diverse (wireless Internet connection, radio frequency, GPRS, 3G, power line communication, and IP). Intelligence. When information from different places on the network has been collected at a central location, it needs to be processed to define whether there’s a need for optimization of the way the network is operated. That’s typically the role of dedicated software. Intervention. The infrastructure will require an intervention, such as adjusting the level of street lighting based on meteorological conditions. A city could enable lighting controls by local area authorities, so that lighting adapts to local weather conditions. Lighting could be switched on when it’s cloudy, or could come on later if the night is clear. A city could vary light intensity depending on the presence of people and vehicles in the street. This would make people aware of what is around them, allowing for better visibility and making them feel safer. In shopping areas, store owners could control the lighting in front of their establishments to interact with their visitors. Light could brighten as someone approaches a storefront, creating an inviting atmosphere. In the case of an emergency, functional and decorative lighting could be combined to provide better visibility and dynamic routing for directing emergency services to a specific location. The network expands beyond lighting by letting other intelligent systems (e.g., traffic, parking, waste management, and park watering) efficiently connect via the ubiquitous network on the light poles. This can be taken even further if light poles are used as hosts for a multitude of sensors that can provide extremely granular and real-time information about air pollution, fine dust levels, ozone levels, noise pollution, and people and traffic flows. This infrastructure platform could be used by local SMEs and software developers worldwide, who are constant creators of new, interesting, and relevant applications. Their innovations can be based on the data generated by the network of light points, sensors, cameras, and other intelligent assets in the public space, enabling new ways of generating revenue by associating data from businesses and infrastructure. The opportunities become endless. Clearly, as systems become more connected and interoperable, the public sector will have to take an “asset bundling approach” with partners, eliminating previously proprietary silos. City governments will need to approach the “Smart Connected City” differently, with an understanding what is “core” and what is “context,” while maintaining centralized control and visibility of critical functions. In order to realize the full potential of connected LED street lighting in the era of the Energy Internet and the Internet of Things, a strong public-private-partnership approach is necessary, to go beyond the silos of existing city infrastructure providers. Asset-bundling and new partnership models will enable the creation of a connected public lighting infrastructure that delivers value to both city administrators and citizens, enhancing the livability of a city. We invite cities, innovators, and business leaders in public services and infrastructure (such as utilities, transportation, traffic, and safety) to join our mission to improve livability in Smart Connected Cities by utilizing the Energy Internet and the connected public lighting platform. discussion and debate around critical challenges in improving health and well-being worldwide. Professional Lighting Solutions Philips Lighting B.V.